As an educator, Aurelia has encountered students with a myriad of different learning styles. Some of them are unable to reach their maximum potential owing to a mismatch between the way they acquire and process information and the way information is delivered to them. This has often impeded the students' ability to learn, particularly those with learning difficulties. It was also observed that most of these students are not motivated to read and many of them do not find Science interesting. 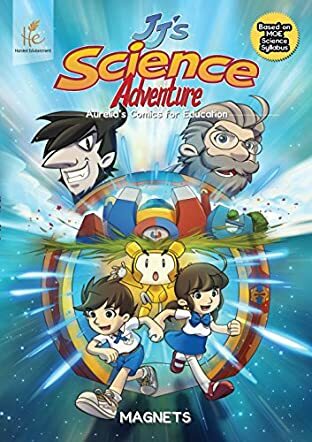 Thus, Aurelia has endeavoured to produce an enjoyable learning tool - JJ's Science Adventure as an alternative medium for children to learn Science. Aurelia is trained as a primary school teacher at National Insitute of Education, Nanyang Technology University. She has more than a decade of teaching experience and has taught in local primary schools and in Chinese Development Assistance Council (CDAC). Aurelia pursued a psychology degree from Murdoch University (Australia) in 2008 and graduated with First Class Honours in 2011. Together with her co-founder Dr. Jonathon Koh and illustrator, Nicholas, they embark on the journey of making education fun. Children are naturally curious but sometimes the attention span doesn't match the subject. Aurelia Tan and Nicholas Liem (illustrator) have mastered it all in their wonderful book, JJ's Science Adventure: Magnets. Through a cartoon adventure, magnets and how they work are explained in the story. It's a fast paced story line that can be read to your children or enjoyed by them alone. Educational material does not have to be tedious or boring! Magnets are one science project that typically keep the students' attention but add in a cartoon factor and you have yourself a winner. The length of this book is just right. It is not so short that it leaves you wanting more or too long to make you wish it were over (kids..you know what I mean). I would have loved to have had this book when I was homeschooling my daughter. Having used trains as an example of how magnets attract and repel is nothing short of brilliant. Author Aurelia Tan and illustrator Nicholas Liem do a fine job of captivating their audience. I found myself doing research on the two types of trains after I was finished with the book. Is there anything better than educational materials that draw more interest to the subject? This is a book that must be in every children's section of libraries, whether public or school. It is so much fun that it could even be used for cub scout or girl scout type meetings or functions. I give this wonderful book two thumbs, way up in the sky.